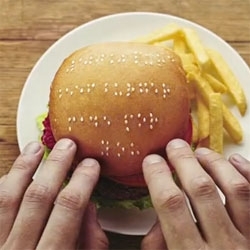 To promote their new braille menus, Wimpy in South Africa used sesame seeds to create braille messages on the top of their burgers. The guy behind it was Wes Phelan. Here’s his site: http://www.wesphelan.co.za/ and here he is on Twitter. The video (below) tells us that through this effort, they reached 800,000 blind people.